What are DC's big plans for Aquaman? 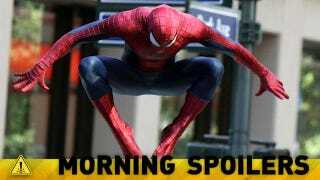 Is another villain really being teased for Amazing Spider-Man 2? And get a look at the new Transformers, some uncanny details about the Flash will be revealed in the next Arrow, and a Fringe co-star joins the 12 Monkeys TV show. Plus, new photos from Dracula. Spoilers ahead! The NYPD are the city's greatest heroes, but sometimes even heroes are left scratching their heads. For instance, when $200,000 goes missing from the armored vault at G.K. Mason Bank. Detective Stan Carter of the NYPD Major Crimes Unit was on scene to comment, stating, "There's still a lot we don't know, but it looks like some kind of sustained vibration literally shook the door off its hinges and ripped the walls apart in the process." Security cameras inside the bank were damaged upon the immediate forced entry of the robber, denying police a clear view of the perpetrator or the means of rupturing the vault. When asked if the NYPD had concerns that the nature of the crime might indicate heightened super-human activity, Carter said, "There's no evidence to point to that yet. When we catch him, we don't expect anything more than a common crook with a clever toy." He's a priority character for the company.
. . . There is no doubt in my mind that this is one of the most well-known characters among superheroes, and in popular culture. With the whole "Miracle" storyline in the past on the island and whatever Brother Blood is cooking in the present, it seems extraordinary elements are entering the world of Arrow, and it is those extraordinary elements that bring Barry to Starling City. Perhaps intentionally, I get a bit of an X-Files vibe from this guy; he's quite curious about the unexpected. 1991: A young Hank, out hunting with his father, has a traumatic experience. Today: Fiona approaches Marie Laveau with a surprising proposition: an alliance between Marie's tribe and the Coven against a common enemy. However, Marie rebuffs her. Meanwhile, Hank reports to the high-powered CEO who has set him on his life's dark path – his father – and is shocked to learn the truth behind Cordelia's blinding. At the Academy, Myrtle has a reunion with Pembroke and Quentin, which does not go well for them, and also renders aid to Cordelia... who finds herself having to sternly broker a peace between Myrtle and Fiona. At the hospital, Nan defies Joan's wishes and visits Luke. Her clairvoyant gifts help her help both mother and son... until Luke reveals a disturbing truth from his family's past. At Cornrow City, Queenie undertakes to give Madame LaLaurie an education in black history. As Cordelia tutors Misty at the Academy, a terrified and regretful Hank returns to beg her forgiveness, but Cordelia sends him away. Marie has given Hank an ultimatum, and Hank, backed into a corner, takes extreme measures.